A patent prevents others from making, using, offering to sell, selling, and/or importing the invention claimed in the patent for the term of the patent. This right to control is a valuable right. A patent also has value by advertising that a product is patented because customers attribute value to a unique product. This value can be reflected in increased sales of the product or a higher price obtained for the product. Investors and banks attribute value to a patent because the patent is an asset of the business. The value of a patent is determined by many factors and depends upon how the patent owner wishes to promote the patent and what the patent owner wishes to get out of the patent. In order to provide protection against others infringing a patent, the patent typically has a wide variety of claims, both broad and narrow, that avoid the prior art. Such a patent oftentimes is expensive to obtain, both in time and dollars. If the primary purpose in obtaining a patent is because of its market or asset value and the patent is not expected to be enforced, then an expensive patent is not always desirable. Currently, the Patent and Trademark Office (PTO) favors narrow patents as opposed to broad patents. Narrow patents are those that protect a very limited range of variations. Narrow patents typically protect a single embodiment and offer no or little protection for variations that are not explicitly claimed. Because applications for narrow patents are so specific and narrowly drafted, the PTO often allows the application with little comment. This results in a quick turnaround time from filing the application to issuing the patent. 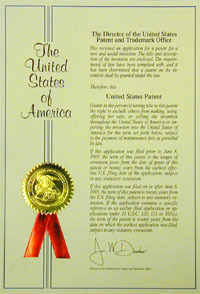 The cost of obtaining such a patent is kept low because there is no or little attorney time spent negotiating with the PTO to obtain the patent. Broad patents are those with claims that protect variations of an invention. Broad patents typically protect multiple embodiments, and are oftentimes very hard to design around. Broad patents typically offer more protection against infringers than a narrow patent. Because patent applications for broad patents cover a lot of ground, the PTO often rejects these applications on the basis of anticipation and/or obviousness. These rejections increase the time required for the application to finally issue as a patent and increase the cost of obtaining that patent. The following graphic illustrates a quick turnaround time and lower cost for a narrow patent relative to the longer prosecution time and higher cost for a broad patent. The difference in how the PTO treats different types of patent applications can be used to the business owner's advantage. For a company in which the market advantage of claiming patent pending or patented for a product is important, a faster track, lower cost patent has advantages. For a startup company seeking investors or financing, having assets in the form of patents has advantages. Likewise, for a company seeking to stake a claim to a market segment by limiting competition, an initial narrow patent, quickly obtained, followed by a broader patent, has advantages. For a company seeking to protect its intellectual property and keep others from the marketplace, initially obtaining a broad patent has advantages. As can be seen, simply thinking that all that is needed is a patent may be oversimplifying things. How the patent is prepared and presented to the PTO is oftentimes dependent upon why the patent is important to the business.